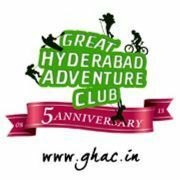 Great Hyderabad Adventure club or GHAC is the Premier Adventure and Trekking Club of Hyderabad,Andhra Pradesh and caters to Outdoor Adventure Activities like trekking, hiking, camping, outdoors, Bird Watching and adventure sports like bouldering, rock climbing, rappelling, paragliding, white water rafting. GHAC is registered with Govt of India as a Not for Profit Adventure Club and duly recognized by A.P Tourism, Govt of Andhra Pradesh as adventure and Tourism Partner. Please read the Club Guidelines and the Disclaimer before any participation. All content on GHAC is under a Creative Commons Attribution-Non Commercial-ShareAlike 3.0 License.